Emile Drummond and children at the airport in Jamaica. Drummond and his children were among a group of 50 Jamaicans who were evacuated from the BVI on Moday. 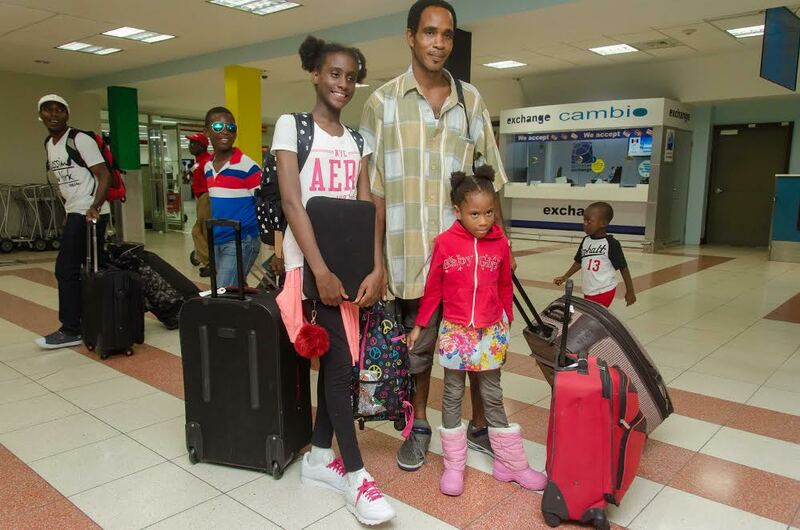 Over 50 Jamaicans who were evacuated from the territory by the Jamaican Government landed in their country Monday, with some sharing their survival stories following the passage of Hurricane Irma. “I am so happy to be here, we barely manage to get out of the BVI,” Dionne Morgan told a local news agency after landing at the Norman Manley International Airport in Kingston. Morgan said she was especially jubilant because of the threats from Hurricane Maria which passed close to the territory between last night and this morning causing minimal damage. She explained that she did not want to experience another category 5 hurricane. “Coming out of a category 5 hurricane to be hit with another category 5… I don’t think I could manage that at all. So, I’m really happy for the Jamaican delegation that came to get us. Thank you,” Morgan said. Emile Drummond who arrived at the local airport with his two daughters described his experience as ‘bad’. “No water, no electricity; you cannot get cold stuff. The place is pretty bad, almost everything is gone. it’s just terrible,” he said. Meanwhile, the Jamaican Government is among several others that have pledged their support to the BVI and other Caribbean islands devastated by hurricane Irma and Maria.